This elegant, sleek, aesthetically pleasing and super comfortable property represents a fantastic opportunity for buyers looking for a great family home in a small exclusive gated community in the Golf Valley. 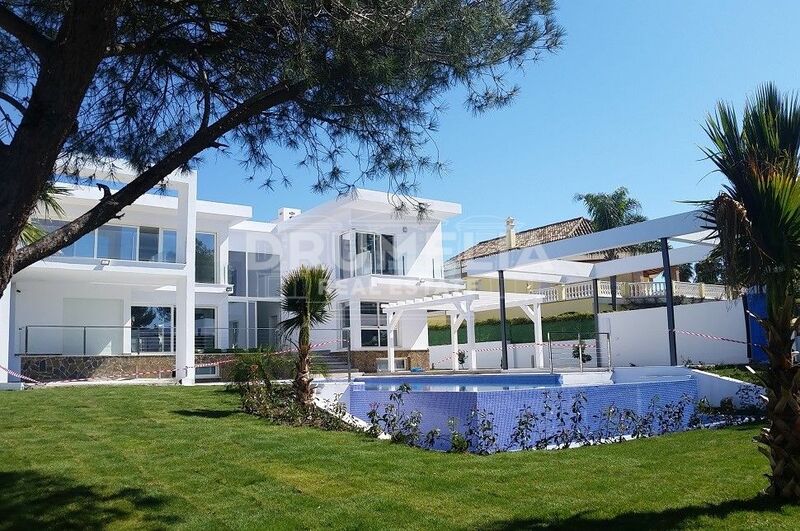 Marvellous villa is a perfect example of how modern design and ultimate luxury come together to celebrate fine living. Stylish modern features and elements both in architecture and interior design have been ideally added to classic Mediterranean ones to create a distinct, exquisite look of this beautiful villa. 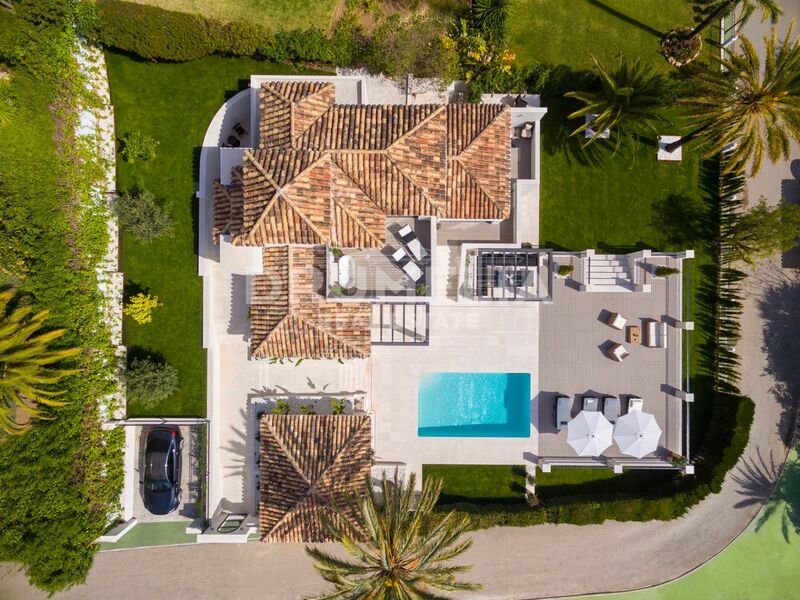 Clay roof tiles, wood flooring and stucco finishes give the fresh contemporary home that Mediterranean character and Southern charm you crave, and the amenities make it a luxury. The interiors are sleek and fresh, focusing on fashionable minimalist neutral colours, elegant simple forms and open plan spaces. Modern materials coexist with traditional noble wood, modern classic style furniture is in harmony with contemporary twist of décor pieces, sophisticated lighting, glass balustrades of staircases. Fabulous South/East-facing property of 416 m² set on 962 m² picturesque split-level plot offers 5 serene bedrooms with luxury en-suite bathrooms, a fully-fitted trendy minimalist kitchen with top quality Siemens appliances and white & black duo palette breathing personality into the space. 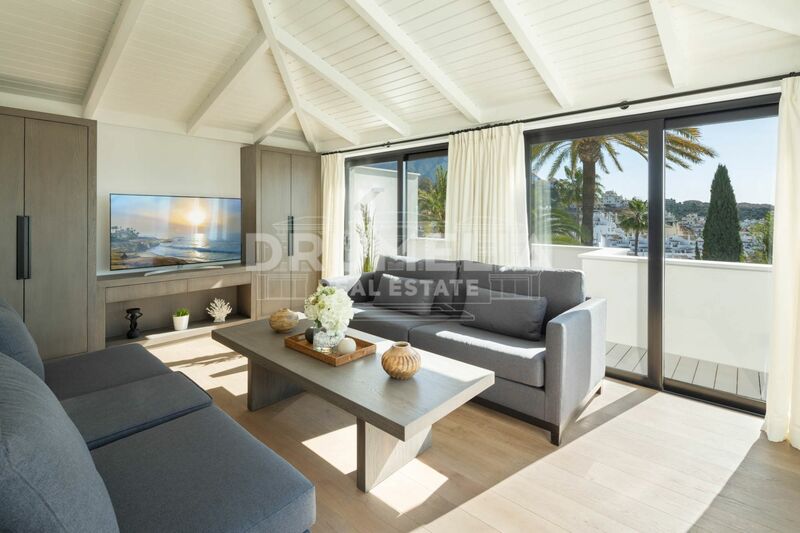 Large bright and sunny living and dining areas are harmoniously combined with tastefully presented, well-appointed and perfectly equipped outdoor living areas: open and covered terraces of 153 m², incl. amazing roof solarium with lounge and freestanding bath, patio, pergolas with chill-out and al fresco dining areas, pool with a shower and massage area. The stairs lead to the wonderful landscaped garden with mature palms and green lawns. Everything is perfect for taking pleasure in all year-round entertaining, sunbathing or watching the world famous romantic Mediterranean sunsets or stunning views to Mediterranean Sea, majestic mountains and peaceful Andalusian surrounding. 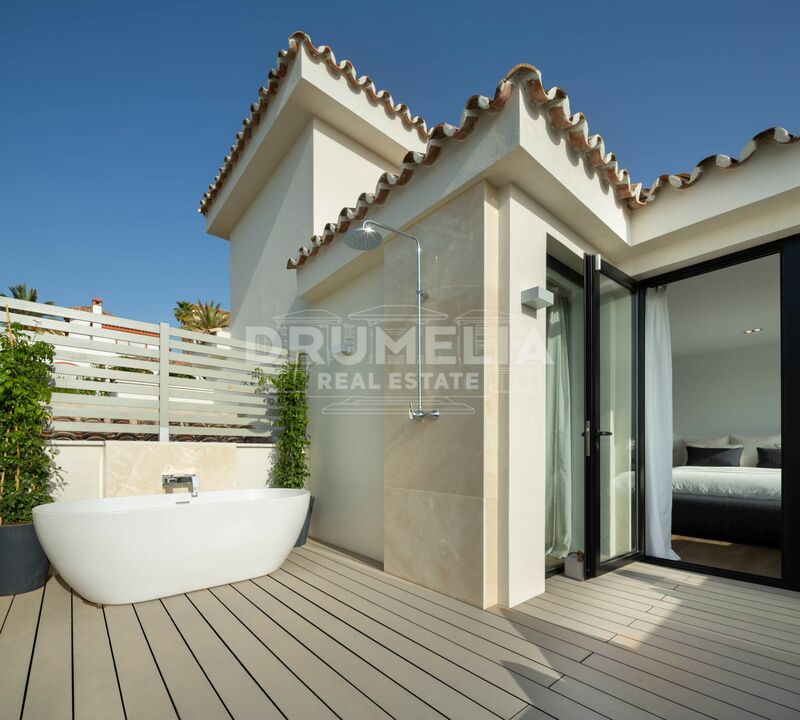 The villa comes with a separately standing impressive garage, a storeroom and many extras that bring comfort and make the property truly exclusive and quite unique. 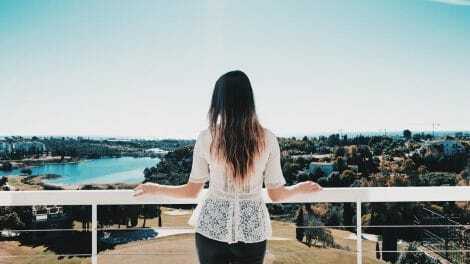 Extremely well connected, you can choose between enjoying a day playing golf, swimming in the sea, discovering natural wonders of Benahavis area or the pleasures offered by Marbella. Set in the exclusive area of La Cerquilla with immediate proximity to first-class golf courses, shops and restaurants, it is only a few minutes’ drive away from chic and glam of glorious Puerto Banús and delightful seaside town of San Pedro, not to mention all the amenities and facilities of Nueva Andalucía at your doorstep.